This PDF 1.5 document has been generated by Microsoft® Word 2013, and has been sent on pdf-archive.com on 11/05/2017 at 17:46, from IP address 146.6.x.x. The current document download page has been viewed 162 times. File size: 325 KB (11 pages). Advisor: Ann M. Mastergeorge, Ph.D. Early Head Start mothers’ parenting. Infant Mental Health Journal. of Human Sciences and Extension. approaches. International Journal of Behavioral Development, 40(5), 442-451.
and Developmental Disabilities, 51(1), 3-12. Paschall, K. W., Mortensen, J. A., Gonzalez, H., Barnett, M. A., &amp; Mastergeorge, A. M. (2015). emotional reactivity. Infant Behavior and Development, 37(3), 387-397. Kopystynka, O., Barnett, M. A., Paschall, K. W., &amp; Curran, M. (Revised and resubmitted). person-centered approach. Journal of Family Psychology. during the transition to adulthood. Children and Youth Services Review. Barnett, M. A., Paschall, K. W., Warren, S., Kopystynska, O, &amp; Curran, M. (Under review). parenting behaviors to young children’s development. Journal of Family Psychology. Paschall, K. W., Mastergeorge, A. M., Dixon, D., &amp; Merk, P. (Under review). community sample. Journal of Community Psychology. Early Home Environments and School Settings. 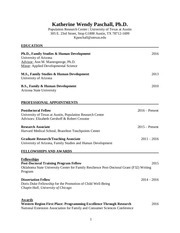 Early Childhood Research Quarterly. to developmental science questions. Target journal: Child Development. with Time-Varying Effects Models. Target journal: Parenting. physical harm. Doris Duke Fellowships for the Promotion of Child Well-Being Blog. Paschall, K. &amp; Mortensen, J. (2014). Effortful control: Implications for children’s development. Frances McClelland Institute for Children, Youth, and Families Research Link, 6(2). Tucson, AZ: The University of Arizona. Available at: https://mcclellandinstitute.arizona. Mastergeorge, A.M., Paschall, K., Hornstein, J., Ayoub, C., Swartz, M., &amp; Singer, J. (2013). Office of Head Start National Center on Parent, Family and Community Engagement. Relationship Research Mini-Conference, Syracuse, NY. parenting, parent well-being, and maltreatment in an Early Head Start sample. In C.
for Research in Child Development Biennial Meeting, Austin, TX. Society for Research in Child Development Biennial Meeting, Austin, TX. approaches to family instability across the transition to parenthood. In M.A. Curran &amp; M.
Ayoub, C., Chazan Cohen, R., Furrer, C., Paschall, K.W., &amp; Von Ende, A. (2016, July). Associations between early parenting and maltreatment in a high-risk sample. In B. Conference on Early Childhood, Washington, D.C.
Paschall, K. W. &amp; Mortensen, J. A., Barnett, M.A. &amp; Mastergeorge, A. M. (2016, May). Relations Annual Conference, Vancouver, B.C., Canada. Development Biennial Meeting, Philadelphia, PA.
positive parenting behaviors in at-risk mothers: A parent-mediated intervention. In M.A. Development Biennial Meeting, Austin, TX. Policy Research Consortium, Washington, D.C.
Social Work and Research Annual Conference, New Orleans, LA. Council on Family Relations Annual Conference, Minneapolis, MN. Cognitive Therapies, New York, NY. the Developmental Methods Conference, Whitefish, MT. 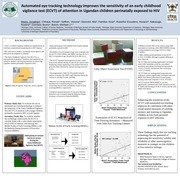 presented at the National Research Conference on Early Childhood, Washington, D.C.
presented at the Society for Prevention Research Annual Meeting, San Francisco, CA. Paschall, K. W. &amp; Mortensen, J. A., Barnett, M.A. &amp; Mastergeorge, A. M. (2015, November). the National Council on Family Relations Annual Conference, Vancouver, B.C., Canada. Mortensen, J. A., Barnett, M. A., Paschall, K. W., &amp; Mastergeorge, A. M. (2015, November). presented at the Head Start Research Conference, Washington, D.C.
Paschall, K. W., Mastergeorge, A.M., Dixon, A., Dixon, D., &amp; Curley, D. (2014, June). Health World Congress, Edinburgh, Scotland, UK. Extension Professionals Galaxy Conference, Pittsburgh, PA.
presented at the American Psychological Association Annual Convention, Honolulu, HI. Mortensen, J. A., &amp; Barnett, M. A., Paschall, K. W., Gonzalez, H., &amp; Mastergeorge A. M.
Child Development Biennial Meeting, Seattle, WA. at the Association of University Centers on Disability Conference, Washington, D.C.
Martinez, C., Dixon, D., Merk., P. Whitmer, E., &amp; Paschall, K.W. (2015, November). conducted at the Society for Prevention Research Annual Meeting, Washington, D.C.
that promote child self-regulation. Family Support Conference, Tucson, AZ. Functions: Part 2. The United Way of Tucson and Southern Arizona, Tucson, AZ. Functions. The United Way of Tucson and Southern Arizona, Tucson, AZ. Executive Functions. The United Way of Tucson and Southern Arizona, Tucson, AZ. United Way of Tucson and Southern Arizona, Tucson, AZ. Paschall, K.W. (2016, February). What the Research Says About Executive Functions: Part 2. The United Way of Tucson and Southern Arizona, Tucson, AZ. Paschall, K.W. (2015, January). Social Cognition. Pima Community College, Tucson, AZ. early childhood childcare workers: Brain Builders for Life: Prenatal to Three. This file has been shared by a user of PDF Archive. Document ID: 00595761.